Sorry if I didn't post last week, we were in vacations in the mountains with limited access to my scrap stash... Let's say I brought some stacks, stamps and my markers, and forgot my acrylic block, my ruler and some ribbons... Anyway we had a great time like always, Fall is fantastic there and weather was too. A lot of inspirational landscapes and colorful nature. Papers are by DCWV : white cardstock, cork and corrugate paper. Rub-ons came from an old collection by 7Gypsies. Acorn charm by Blue Moon Beads. Alpha stickers by Sticko (EK Success). The rub-ons are really popping from the tag with this technique ! Are you gonna try it ? If so, have fun, and in any case, see you soon ! Thank you Mylissa ! I'm trying my best with my limited Tim's stash, and seeing your comment is very rewarding ! Cute cute take. 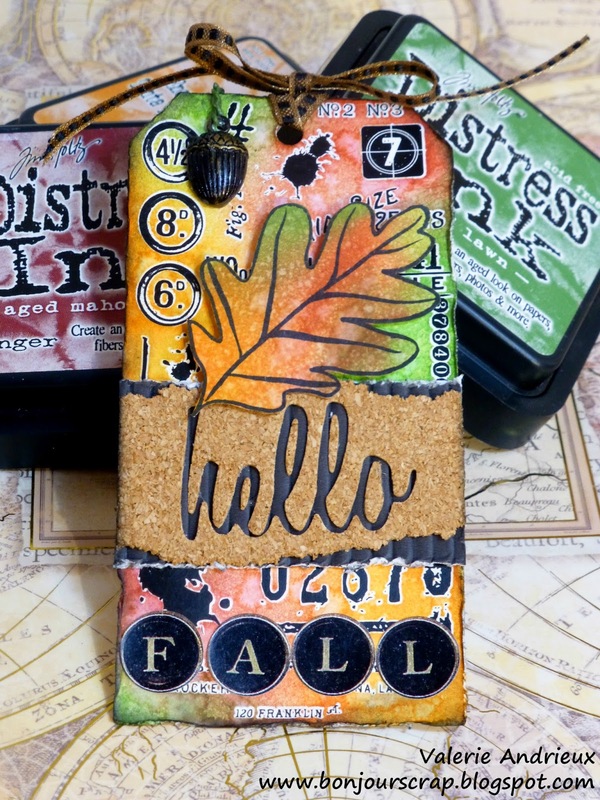 LOVe the whimsical leaf and bright colors. Thanks ! I'm sooo happy ! Love the whimsical look to your tag! Congratulations on your win! Beautiful tag!! You got those fall colours just perfect. Congrats on your win! So kind of you ! Thanks Cathy ! I can't help but use bright colors... Thanks for your comment ! Giveaway : 30 cards before Christmas 2016 ! My card in Craft Stamper !